Sipi Falls, Uganda and the best coffee in the World. – Crickey…….we're in Africa! 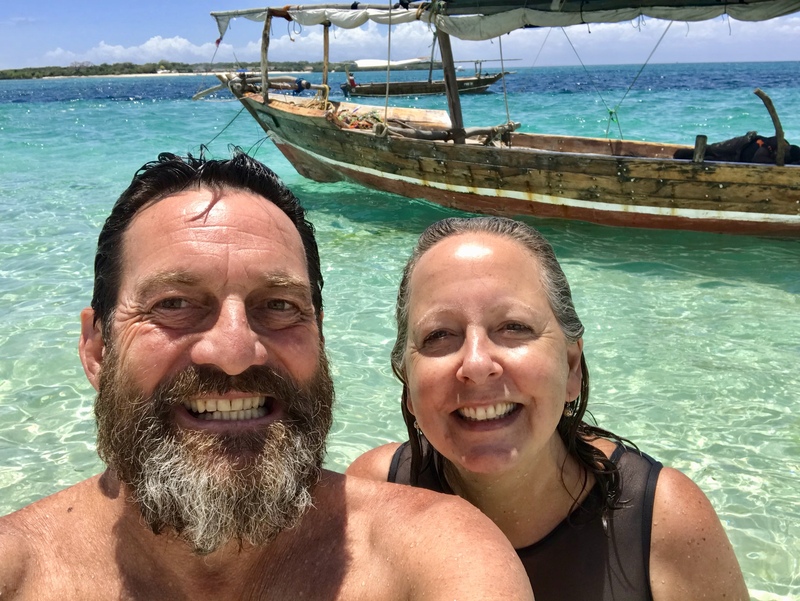 March 23, 2019 Marcus and Pauline3 Comments on Sipi Falls, Uganda and the best coffee in the World. Sipi Falls, Uganda and the best coffee in the World. After entering Uganda we had a slow very steep track that wound up and around the Mount Elgon National Park which took us around eight hours to travel 137 kilometres. There is no wonder that the Suam border crossing that we used between Kenya and Uganda is not very well used because it is little more than a track on the Uganda side. It was very heavily populated and a hive of activity with the locals trying to get the paddocks ready for planting because from March onwards they expect the rains. Our first stop in Uganda was at the Sipi Falls and according to our app iOverlander the camp with the best view was Mose’s Camp so we headed straight for there. The camp looks directly over the lower falls and also out over a vast plain to the West so we had spectacular views. It is a very basic camp with smelly drop loos and cold showers in a bucket hanging from a pole but that’s Africa baby! The restaurant/bar were very basic too with no power so no cold beer and wood fires to cook on, so if you wanted cold beer they would run up the road to get it for you. None the less the family who ran the camp were very friendly and we ended up loving our three nights in their camp. We were the only ones at the camp so once we got ourselves set up I then I asked Peter who worked there where I could go to get a sim card for our phone and also an ATM for some cash. He promptly suggested that he take me on the Boda Boda (motorbike) and at first I thought heck do I want to put my life in his hands because after all we had seen the way they ride and no helmets or any other protection was also a concern! What the heck let’s go and true to form I was terrified by some of his overtaking manoeuvres but we made the 20 kilometres to the next big town and he guided me through the process of getting a sim card, then we got the cash and then amazingly returned in one piece! Peter also offered to guide us the next day on a walk up to the Sipi Falls and also on a coffee farm tour which we agreed to. Getting towards evening we were joined by a second set of campers who it turns out were from Germany and as it goes we were to see quite a lot of them over the next week or so as we journeyed North. Klaus, Hedwig along with their adult children Eva and Christoph were in Uganda for ten days and I think spent six of those with us as we all travelled north to Kidepo National Park and then down to the Murchison Falls. We really enjoyed their company and I hope they didn’t mind spending so much time with us Aussies. So the next morning we set off for the walk to the top of the Sipi Falls and when you consider that they are in actual fact a series of three waterfalls spaced quite some way apart, we were in for a lot of climbing. The walk went up through small but intensive farms mainly growing coffee and bananas but also some cassava, tomatoes, avocados and potatoes. There are no public tracks so you basically walk through peoples farms and yards saying hello as you go which was great fun. We really enjoyed the scramble up to the last falls as it was quite steep and cut into the cliff going virtually straight up and the view from the top was outstanding. We were of course puffing and panting but then we came across some women carry sacks of around 15 or 20 cabbages on their heads which just blew our minds! Some of the water at the top is taken off and piped all the way down through the valley to points where anyone could use it I’m guessing mainly for drinking because everyone uses the river to wash themselves and their cloths. By the time we reached the top the day was really starting to get hot and we used the river to cool down in. Thinking that it was all down hill from there we felt alright but no it was up and down, and the down was very difficult to navigate without slipping all the way down! By the time we reached the camp after 11 kilometres and according to my app 66 floors, we were totally exhausted from the heat and exertion so a couple of cold Ugandan beers went down very well. The top falls of the three at Sipi Falls. Our walk up to the top of the highest falls. Hoorah we made it thanks to our super guide Peter! I just love this panorama shot from the top of the Sipi Falls. These beautiful flowers were along the path. A view of the middle falls. Apparently a new driver and he had never driven on windy mountain roads. Around 20 people lost their lives when it went over the side. We then had a two hour break before our coffee farm tour so we found a good shady spot and just relaxed. Peter was proving to be an excellent guide, a great bloke to be with, had loads of energy and a great sense of humour. The walk to the coffee farm was only about three kilometres there and back and we were joined by Klaus, Hedwig and Eva which was great and again we walked through all the farms and family house plots to get there. These coffee farms are not big concerns but rather very small plots of 40 to 50 trees and the coffee dried green beans are sold to a cooperative who on sell them. Once there we went through the process of making our own coffee from scratch. This involved using a mortar and pestle to knock the husks off the already dried green beans and we all had a go at this, before winnowing the husks away from the beans using a gold panning method utilising the breeze. Pauline also found it useful to blow across the beans to do this! The beans were then put in a pan and roasted over a wood fire that was regulated by adding or taking away some bits of firewood. At this stage I was thinking that the coffee was going to be terrible and most likely bitter! We then tipped the roasted beans back into the mortar and pestle and all had a go at pulverising the roasted coffee beans and while we were busy doing that they had some water on the fire to boil. The ground coffee was then plunged straight into the boiling water which again set off the alarm bells. It was then served black and we all tried the coffee as it was before if we wished added some sugar. It was quite surprisingly outstanding coffee, strong but with not a hint of bitterness in fact it was very smooth. I laughed though when Peter took his coffee and promptly added two heaped dessert spoonfuls of sugar to it! We all bought some coffee to take away with us and Pauline and I bought two bags of 500 gram ground coffee because we always stop on the road at 10.30am for a coffee and we thought this would be perfect. Being a bit of a doubting Thomas though I figured that the coffee we bought would probably not measure up to what we had just made but I’m happy to say that it’s just as good. The coffee seedling and a bowl of dried green coffee beans. The green beans after we had given them a pounding with the mortar and pestle. Pauline winnowing the husks of the green coffee beans. Roasting the coffee beans over the fire. The coffee farmer with from left Hedwig, Klaus, Eva and us! Our next destination is the Kidepo National Park right up in the North of Uganda and has a boundary with South Sudan. Two heaped dessert spoons of sugar in a cup of coffee?!! They do use up lot of energy walking up and down those hills! Previous Lake Naivasha and the Eldoret Discovery Tour. Next Kidepo National Park in northern Uganda.